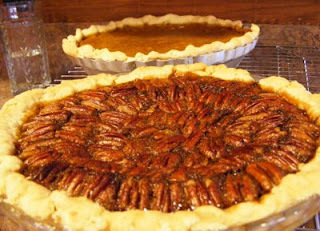 I first made a pecan pie when I was just married, that was 16 years ago. I used a Dear Abby recipe that I clipped out of the Tulsa World Newspaper. I thought it was a little too buttery, sorry Dear Abby. I worked with it and came up with this recipe. Hope you will give it a try. Pecan Pie is one of my many favorites. In a large bowl, combine corn syrup, sugar, eggs, butter, salt and vanilla; mix well. Pour filling into unbaked pie crust; I place pecans in a pretty pattern around the top of the pie. If crust or pie appears to be getting too brown, cover with foil for the remaining baking time. Remove from oven and cool.